Common Core State Standards for Writing are divided into ten anchor standards. These are available in a regular version and in a second version for history/social studies, science and technical subjects. The wording for the anchor standards for each section is identical between the two versions, but the grade-level specifics for the regular version are different from the grade-level specifics for the version for technical subjects. In some states, agriculture instructors use the version for technical subjects. 1. Write arguments to support claims in an analysis of substantive topics or texts using valid reasoning and relevant and sufficient evidence. SEE EXAMPLE. 2. Write informative/explanatory texts to examine and convey complex ideas and information clearly and accurately through the effective selection, organization, and analysis of content. SEE EXAMPLE. 3. Write narratives to develop real or imagined experiences or events using effective technique, well-chosen details and well-structured event sequences. SEE EXAMPLE. 4. Produce clear and coherent writing in which the development, organization, and style are appropriate to task, purpose, and audience. SEE EXAMPLE. 5. Develop and strengthen writing as needed by planning, revising, editing, rewriting, or trying a new approach. SEE EXAMPLE. 6. Use technology, including the Internet, to produce and publish writing and to interact and collaborate with others. SEE EXAMPLE. 7. Conduct short as well as more sustained research projects based on focused questions, demonstrating understanding of the subject under investigation. SEE EXAMPLE. 8. Gather relevant information from multiple print and digital sources, assess the credibility and accuracy of each source, and integrate the information while avoiding plagiarism. SEE EXAMPLE. 9. Draw evidence from literary or informational texts to support analysis, reflection, and research. SEE EXAMPLE. 10. Write routinely over extended time frames (time for research, reflection, and revision) and shorter time frames (a single sitting or a day or two) for a range of tasks, purposes, and audiences. SEE EXAMPLE. Writing Anchor Standard 1. Write arguments to support claims in an analysis of substantive topics or texts using valid reasoning and relevant and sufficient evidence. This lesson discusses the laws governing water quality in the United States. The PowerPoint reviews main points of the lesson. Exercise 1 has students research a "citizen lawsuit" related to water quality legislation. They must answer a series of specific questions and list the resources they used to find that information. Writing Anchor Standard 2. Write informative/explanatory texts to examine and convey complex ideas and information clearly and accurately through the effective selection, organization, and analysis of content. This lesson covers emergency planning to help avoid risks in the floral shop. The PowerPoint reviews main points from the lesson. Exercise 1 for this lesson has students work in small groups to create a 12-page safety manual for a floral shop. Writing Anchor Standard 3. Write narratives to develop real or imagined experiences or events using effective technique, well-chosen details and well-structured event sequences. The topic of this lesson is news writing and how to prepare a news story. The PowerPoint for this lesson reviews main lesson points. In exercises for this lesson, a student chooses a news topic, finds background information, prepares questions and writes a news story using an inverted pyramid news story format. Writing Anchor Standard 4. Produce clear and coherent writing in which the development, organization, and style are appropriate to task, purpose, and audience. Companies supplying the drugs used to prevent and treat animal diseases are discussed in this lesson. An AgEdNet.com Links page provides some examples of agribusiness companies providing animal health products. The exercises for this and many other lessons ask students to research a topic (animal health information in this case) and write a report explaining what they found and why it matters. Writing Anchor Standard 5. Develop and strengthen writing as needed by planning, revising, editing, rewriting, or trying a new approach. This lesson presents options to buy, lease or rent farm equipment. The exercises uses small groups to research the cost of buying, leasing or renting farm equipment. Each team compiles the information from one dealer or source. Representatives of each group pool their information to make a class report. This report is distributed to all class members. Each student prepares a report on one piece of equipment comparing the costs to purchase or lease the equipment. The individual reports include what factors and alternatives he or she would consider in choosing to lease or buy. Writing Anchor Standard 6. Use technology, including the Internet, to produce and publish writing and to interact and collaborate with others. The topic of this lesson is how to use PowerPoints to communicate agricultural topics. It includes how to use and plan a PowerPoint; and tips for making an effective presentation. The Powerpoint for this lesson reviews main lesson ideas with illustrations. Students work in small groups and follow a checklist to complete PowerPoints in the exercises for this lesson. Writing Anchor Standard 7. Conduct short as well as more sustained research projects based on focused questions, demonstrating understanding of the subject under investigation. This lesson explores why marketing so important in aquaculture. The exercises for this lesson ask students to conduct a marketing survey of at least 15 people. After completing the survey, the students are asked to design an attractive label for a new fish or fish product. Each student will also develop a sales speech to sell a new fish or fish product and present it to the class. Writing Anchor Standard 8. Gather relevant information from multiple print and digital sources, assess the credibility and accuracy of each source, and integrate the information while avoiding plagiarism. This lesson explains how to find and evaluate internet sources for school reports or projects. The PowerPoint summarizes and reinforces main lesson ideas. Exercises 2 and 3 are small group activities asking students to evaluate a website and email for credibility. 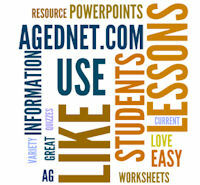 Many other AgEdNet.com lesson exercises ask students to record information about internet resources they use as research resources. Writing Anchor Standard 9. Draw evidence from literary or informational texts to support analysis, reflection, and research. This lesson discusses the risks and rewards of biotechnology research. The lesson PowerPoint reviews main points from the lesson. The worksheet for exercise 1 asks students to find and answer questions about one or more news articles or research reports about a genetically modified (GM) plant or animal. For exercise 2, students write a short paragraph explaining the topic they read about and include an opinion on whether the benefits of the GM plant or animal outweigh its risks. Students then work in small groups to present the information they discovered to other members of their group. After each presentation, group members discuss the conclusions and opinion and whether or not they agree. Writing Anchor Standard 10. Write routinely over extended time frames (time for research, reflection, and revision) and shorter time frames (a single sitting or a day or two) for a range of tasks, purposes, and audiences. Use AgEd Today news articles as the beginning of an extended writing assignment. Ask students to read a news article of their choice. Then ask them to summarize the main ideas from the news article using the AgEd Today News Review Worksheet. Using that information as a starting point, have students write about the main topic of the news article for several different audiences and purposes. For example, they could be asked to write an explanation of the topic for use as a lesson for other high school students. Then, change things up and ask them to write about the topic as a story for third-grade readers. Another assignment could be to write a letter to the editor responding to some point in the news article. Or, they could find an editorial or opinion piece about the same topic, and compare and contrast it with the original news article.